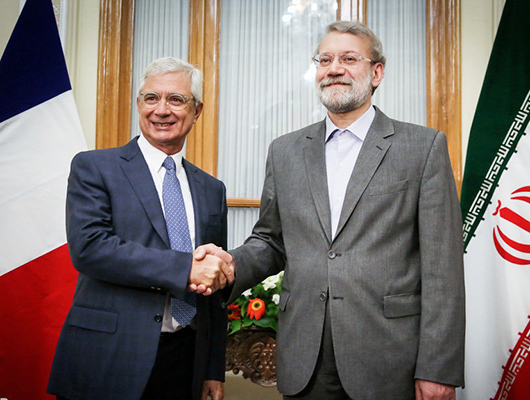 Iranian Parliament Speaker Ali Larijani and President of France’s National Assembly Claude Bartolone discussed a range of issues in a meeting on Tuesday, with the Iranian side hailing common views on the Middle East crises and the fight against terrorism. Speaking at a joint press conference after a meeting with Bartolone in Tehran, Larijani said parliaments of the two nations share common views on the regional crises and battling terrorism. He also noted that the talks have covered the latest developments in Iraq, Syria and Lebanon, as well as the ways to enhance economic relations between Tehran and Paris. For his part, Bartolone praised good relations between parliaments of Iran and France, saying useful negotiations have been held on nuclear agreements and economic relations between the two countries. The visiting French lawmaker also noted that such meetings will help in implementing the Joint Comprehensive Plan of Action (JCPOA), a nuclear deal between Tehran and the Group 5+1 (Russia, China, the US, Britain, France and Germany), and will also result in the removal of banking obstacles, presence of French businesses in Iran and expansion of economic ties. Heading a parliamentary delegation from France, Bartolone is Iran for a two-day visit that will include meetings with Iranian President Hassan Rouhani, Chairman of Iran’s Expediency Council Ayatollah Akbar Hashemi Rafsanjani, Foreign Minister Mohammad Javad Zarif, and Secretary of the Supreme National Security Council Ali Shamkhani. Bartolone was expected to visit Iran in mid-July, but postponed his trip after a terrorist attack in the southern French city of Nice on July 14.